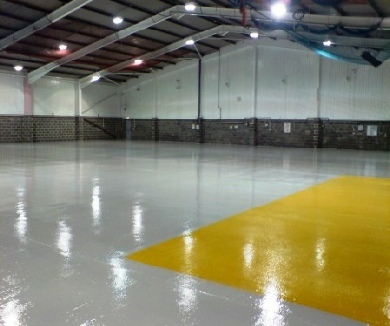 Epoxy Resin and Polyurethane flooring systems are particularly suitable for warehouse & factory environments such as Production Areas, Storage Areas and general industrial use. Where a hard-wearing, attractive floor finish is required, the available resin flooring systems can also assist in providing safe designated pedestrian walkways and fork-lift truck aisleways, work stations, hazard and danger areas, letters and numerals and to mark out guidance to fire exits in line with Health & Safety requirements. Properties such as anti-slip and enhanced chemical resistance can also be incorporated where necessary.